New global competitive survey results show that 43% of international tourists with special needs are complaining during their stay. Are destinations and tourism businesses truly efficient in welcoming tourists with special needs? 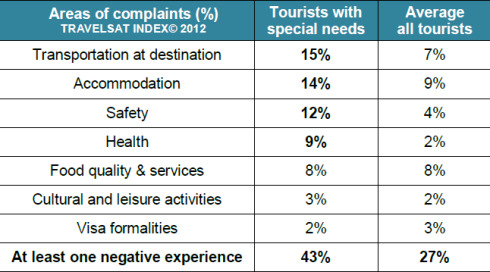 Based on its reference global benchmarking survey TRAVELSAT© Competitive Index, TCI Research reports that nearly half of international tourists with special needs traveling in the world have been in a situation to complain following to a negative experience during their stay. This percentage is almost twice as high as for average tourists. Table showing 43% of "tourists with special needs" have at least one negative experience, whereas the average for al tourists is 27%. Areas of complaint mostly focus on accommodation and transportation at destinations, generating also more negative experiences related to safety and health.The survey also reports quite significant discrepancies in quality performances according to the destination visited. TCI Research CEO Olivier Henry-Biabaud comments: “Many destinations and hotels promote “tourism for all” as part of their social responsibility agenda; however the challenge for improving experience in ground remains difficult to take up. Yet gaining competitiveness on this demanding segment is worth being encouraged since travelers with special needs can be very loyal, high spenders and influencers for shaping destinations and tourism industries’ social responsibility reputation”. TRAVELSAT© Competitive Index is the reference, global and independent survey benchmarking international tourists’ experience and satisfaction in a standard way for all destinations. It monitors 80+ Satisfaction Indexes for over 200 destinations, markets and segments, based on representative opinion of tourists who experienced the destination. Awarded in 2011 by the UNWTO for its major contribution in tourism governance, TRAVELSAT© provides a innovative instrument for all national, regional and local tourism stakeholders willing to improve their competitiveness in a global and complex international competitive environment. Thanks to our friends at About Tourism for bringing this survey to our attention.